N3 is now populated with over 600 related grammar points so that you can compare and contrast similar grammar structures, nuances, and example sentences side-by-side, all in the same window. N2, Lesson 9 is now available! With the December JLPT less than a month away, it is the perfect time to start cramming! We have added a few features to Cram to enhance your grammar studies. You can now see stats about your cram sessions. These include stats such as overall accuracy, total time spent cramming, and reviews per cram session. In addition to All, Studied and Studied Sentences, you can now choose to study ‘Troubled Grammar’. This is grammar that you have missed more than four times during your normal review sessions. We have also made additional changes to the summary and stats pages for both normal reviews and cram sessions. Instead of showing your accuracy percentage as a whole number, it will now show up to two decimal places so you can see and measure your progress in finer detail. Cram allows you to review random example sentences from a particular JLPT level. Cram draws from every available study question in our database to cover a variety of situations and nuances. You can cram for as long as you like without affecting your normal review SRS. If you would like to see a certain stat, or you have any suggestions on how to improve Bunpro, please let us know! Option to search within a specific JLPT level or textbook. Search results dynamically reflect what is typed to find grammar points more quickly. Each grammar point now displays offline resources and page numbers to immediately reference textbooks for more information. Searching in English now automatically returns results in English! Happy Thanksgiving, everyone! We are thankful for all of your kind words, support and feedback. We hope that we can continue to live up to your expectations! N2 Lesson 10 is now available! 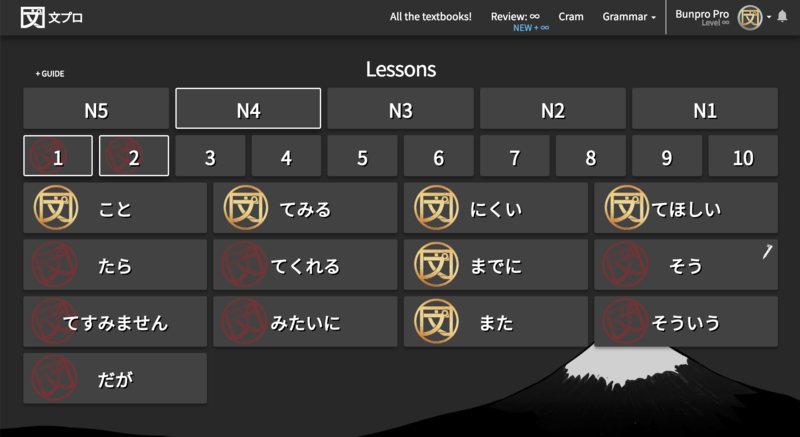 While we still have some sentences to add and there will inevitably be some grammar points that we will include in the future, the core of JLPT N2 is finally here! With just over a week until the December JLPT, we realize that this does not give you ample time to study all of the newly added grammar points, but we hope that you can brush up on some points that you might be having trouble with and maybe even get a few cram sessions in. N2 Lesson 1 now has 12 sentences and 12 review questions! Track how many days in a row you have studied. Get motivated to make progress by earning XP, leveling up and collecting badges. Block out distractions and focus during reviews. Bunpro now tracks the amount of consecutive days you have signed into Bunpro and have done at least one review. Everyone will now earn experience points from reviewing grammar on Bunpro. Every time you put in a correct answer for a grammar point in reviews, you will receive XP. The amount of XP you earn is directly proportional to the grammar point’s current streak. The amount of XP you have earned can be viewed under the Account dropdown or on your Profile page. You can now level up in Bunpro! Your level corresponds to the amount of XP you have earned from reviewing grammar. The amount of XP required for reaching the next level is shown on the right side of the XP progress bar in Reviews or in the Account dropdown. You will also be rewarded with badges, medals and other achievements for earning a certain number of XP, leveling up, staying consistent with your studies, or completing hidden challenges. To better maintain focus on your studies, you now have the ability to hide the heads-up display (HUD) in reviews. This includes the top menu bar, your remaining review count, percentage, SRS and ghost review indicators, and your XP progress bar. Simply click Focus On in the dropdown menu in reviews to turn on Focus. Set Focus to your default review set up in Settings. N4 Audio - All N4 example sentences and review questions have now been updated to include audio. Discourse Links - All of N5 grammar points are now accompanied with links to the forums so that you can discuss grammar points in greater detail. Your Bunpro level will now appear as flair on the Bunpro community! Just log out and back in on the forums to display your level next to your profile picture. Cheers! Study what you learn in your textbook right alongside Bunpro. Make a textbook your primary study resource. Add an entire chapter or choose individual grammar points from each chapter to study and add to your reviews. Search now returns both Japanese and English to make it easier to find exactly what you are looking for. For the first week of January, the Bunpro Lifetime Membership will be available for $120 (normally $150). 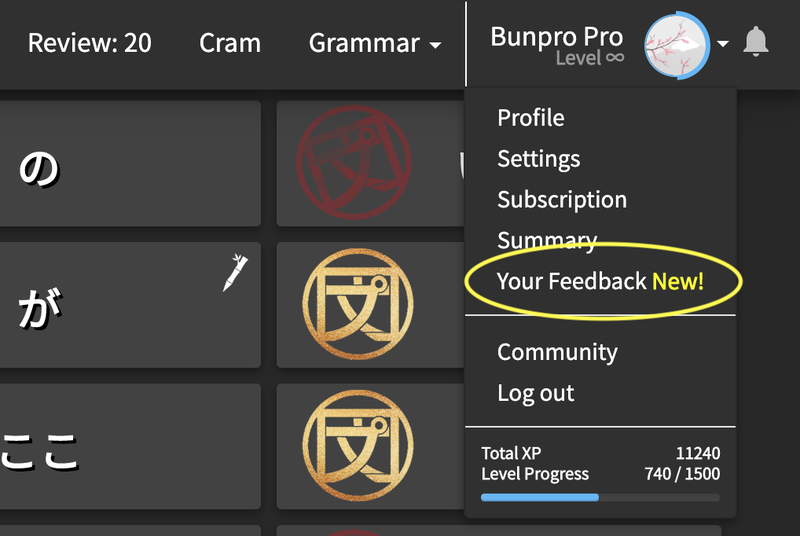 Your Bunpro level now updates instantaneously on the forums when you level up on Bunpro. The second edition of みんなの日本語 II is now available in Paths! Study what you learn in your みんなの日本語 II right alongside Bunpro, page by page, chapter by chapter, grammar point by grammar point. N2 Lesson 2 now has 12 sentences and 12 review questions! Now that we have released Paths, we have shifted our focus to adding the rest of N2 example sentences and study (review) questions. We hope to have extra N2 example sentences and review questions available every week or every other week. In addition, we are also polishing all of the lower levels’ content, fixing audio and ironing out any remaining kinks. We really appreciate all of the invaluable feedback you have provided us. Thank you for your patience. Cheers! N2 Lesson 3 now has 12 sentences and 12 review questions! N2 Lesson 7 now has 12 sentences and 12 review questions! N2 Lesson 8 now has 12 sentences and 12 review questions! All N2 Lesson 9 grammar points now have 12 sentences and 12 review questions! All N2 Lesson 10 grammar points now have 12 sentences and 12 review questions! This means that all N2 grammar points now have enough study questions for each SRS interval, meaning every sentence that you come across will be different from the last. Each review session will test your knowledge of the grammar point in new and unique contexts every time, so you no longer simply memorize sentences. Since Bunpro’s sentences are written in a way that build upon previously studied grammar, you also get more and more exposure to the grammar points that you have learned as you progress through each subsequent level on Bunpro. Ooooh Shiny! Grammar tiles now display when you have passed all 12 SRS intervals and “burned” a grammar point. Now that N2 grammar points have 12 sentences and 12 review questions, we are putting all of our effort into polishing all of the lower levels’ content, which means adding missing grammar points, fixing audio and ironing out any remaining kinks. Thank you for all of your kind words, support, feedback, and suggestions. Please let us know if there is anything that we can do to improve your experience! Cheers! Newly added grammar points include breakdowns, 12 example sentences and 12 review questions, external links and textbook page numbers. Audio for each sentence will be added soon! N1, Lesson 1 is now available!